In Excel 2010, macros are disabled by default. Follow these steps, to enable macros in Excel 2010. Step 1 – Click on “File” at the top left of the menu and select “Options” from the left side bar showing in the image below. Then select “Trust Center” on the left and then click on “Trust Center settings…” on the far right of that window. Step 2 - The Trust center setting dialog window will pop up as shown below. 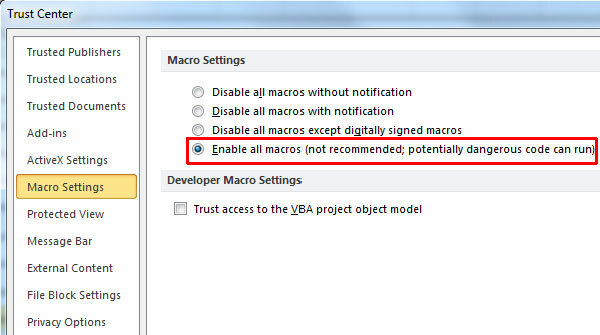 Select “Macro Settings” from the left sidebar and choose the “Enable All macros” option and then click OK. Excel will tell you this is not recommended and potentially dangerous, but your virus program should be adequate to stop any Excel viruses (which are relatively rare these days).